"F.A.B., whatever that's supposed to mean"
Occasionally, Mr Monkey helps out at International Rescue, usually when one of the Tracy boys gets his strings tangled up. 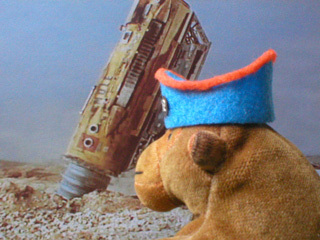 Mr Monkey prefers to fly Thunderbird 2, because he likes finding out what toys Brains has hidden in the pods. 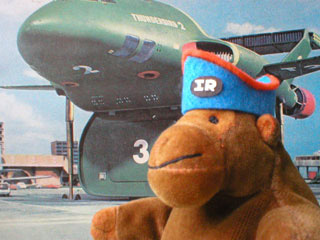 Mr Monkey's thunderbirds hat is made from felt, with a badge from card.